More jobs, improved safety and increased accountability of elected officials are needed to improve Austin’s economic future, local residents said Tuesday at a community meeting hosted by Cook County Commissioner Richard Boykin. 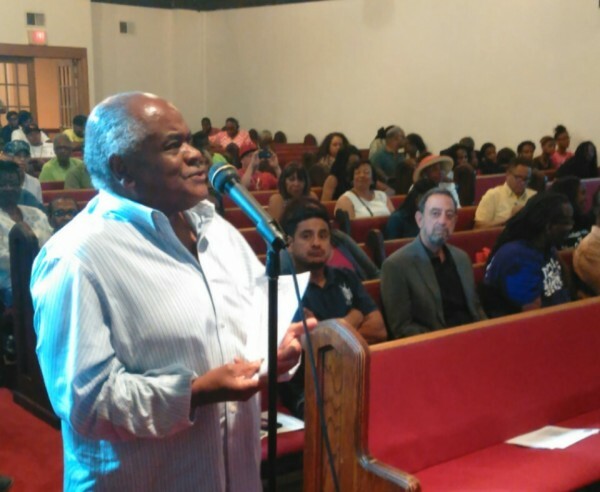 Some 60 residents sat in Greater St. John Bible Church for the listening tour that focused on Chicago’s “endangered population” of black neighborhoods. The 1st District commissioner will take his tour to the South Side next week but focused this week on Austin. The event was tense as many residents spoke out in anger and frustration about their living conditions. Boykin and other elected officials and community leaders mostly listened. “I’m tired. I’m 51 years old, and I’m tired,” said resident Brenda Thomas, who complained about the poor street lighting in her neighborhood that’s gone ignored by the city, and that’s also attracting criminals to the area. “I need my light fixed. I’m afraid in my home. I’m about to get me a gun and start carrying it if I can’t come out of my home,” Thomas said. The community needs more resources, especially for job creation, said resident Jonathan Todd, a clinical social worker. Passions and frustrations remained high during the two-hour meeting. “We’re not getting angry enough,” said Milton Johnson, a resident who also works as a community liaison at Bobby E. Wright Behavioral Health Center in East Garfield Park. Much of the anger was directed toward the elected officials themselves. Too many city lawmakers have sided with Mayor Rahm Emanuel over their constituents, many said. One resident urged his neighbors to vote those lawmakers who backed Emanuel’s tax and fee increases out of office at the next election. In response, Austin Ald. Chris Taliaferro (29th), said the mayor often withholds resources from wards whose aldermen oppose him. Needed resources, Taliaferro insisted, should not be used as bargaining chips by the mayor. The room’s anger, however, included some hope. To combat gang violence, one resident called for more intervention programs. Chicago also needs to create transitional “safe houses” outside the city for former gang-bangers trying to escape the street life, the resident said. More than a dozen residents spoke, many wanting to see more trade schools, job centers and youth programs offered. Improved city services and better communication from elected officials about resources – and about meetings like Tuesday night’s listening tour – are also needed, residents said. Some young people also took to the mic to offer solutions and their personal story. Terry Keivious, 24, said he’s seen and experienced every hardship imaginable, including a stint in jail. He said he’s left that life behind and encouraged other young folk to choose a better path. Keivious also strongly supports having more youth programs. “I’m living proof that they work. If they didn’t work, I wouldn’t be here,” he said. Boykin kicked off his listening tour, which runs through November, last week at New Mt. Pilgrim Missionary Baptist Church in West Garfield Park. Boykin said the solutions discussed this week at Greater St. John and other meetings will be put into an action plan and presented to the city, county and state leadership. Oct. 11 and 25, and Nov. 1 and 8: Location to be determined. All events are from 6-8 p.m. For more information, contact Boykin at (312) 603-4566 or email him at richard.boykin@cookcountyil.gov. Commissioner Richard Boykin and Cook County Sheriff Dart organized the June 19th discussion. The newly elected commissioner and the rest of the Cook County Board is being sworn in Dec. 3 for four-year terms. After years of work involving dozens of West Side residents, the spotlight will be on the plan from 10 a.m. to 12 p.m. Dec. 15. The event - organized by Austin Coming Together - will be held at Michele Clark High School, 5101 W. Harrison St.
All are welcome for outreach and fellowship on July 14 from 11 a.m. to 2 p.m. at 1256 N. Waller Ave.